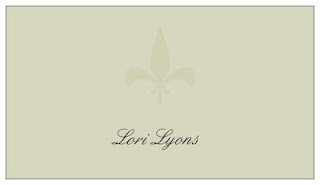 The Lyons Din: What am I? I decided this week that I needed to make myself some new business cards. The ones the venerable newspaper gave me many moons ago are completely out of date. They didn't get me new ones when they moved me from Prep Writer to Perp Writer two years ago. Rather, they told me to just white out the old number and write in the new one. Maybe I should have seen the print on the wall then, huh? Come October, they'll be complete useless. And I have to spend the time in between letting anyone who wants to know how to get in touch with me. 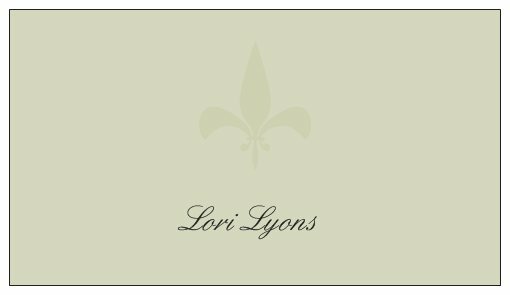 So I went to this cool web site where you can design and order your own business cards, with the correct numbers on them. With the help of my 11-year-old, who told me that I needed to choose a design that reflected my personality, I chose one that, I thought, was elegant and professional to help in my future pursuits. Then I set about adding the correct info. Then I turned to the back, where you are supposed to add your information, beginning with title. And I stopped. A sports writer? A crime reporter? A clerk? A journalist? A story teller? A social media specialist? An Internet junkie? A news junkie? A job-seeker? For more than 20 years I was able to answer that question without hesitation. I was a sports writer. A pretty damned good one. I covered mostly high school games, an occasional minor league baseball team, some LSU baseball. Wrote interesting little feature stories on local athletes. Broke breaking news. Drove around the state, seeing tiny towns I had never even heard of. Won awards. Made tons of friends and contacts across the state. Earned their respect. Loved my life. Then the men in ties who only saw me at the annual Christmas party told me I that was no longer to do that. I was to be the office-clerk-who-covers-crime. They sat me at a desk and made me watch a clock. Instead of athletes scoring touchdowns, I wrote about men murdering their wives and molesting their children. And people who just don't know how to drive. And the hardest part of that whole thing was, they didn't just take away what I did. They took away who I was. What am I? Besides coach's wife, mother, step mother and World's Best Luau Thrower? And what will I be?